Dial Height Gauge - 6"
Grizzly G9618 - Dial Height Gauge - 6"
This precision Dial Height Gauge provides accurate measurements to 6" with readings in 0.001" increments. Features fine adjustment and lock, shockproof stainless steel construction and carbide tipped scriber. Case not included. Ya know, for the price ya cant beat it. Dont use it for a hammer and itll be good and reliable for years to come.. That scribe piece is sharp, keep the cap on it. Came with imperfections on the rack that cause skipping. Not reliable, measurement needs to be verified with another tool. I needed a height gauge for layout work. 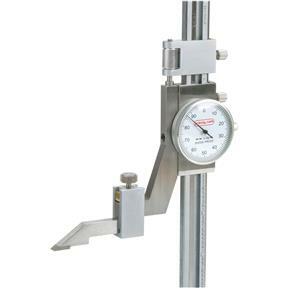 This is just the right size and the accuracy can't be beat for a low cost gauge. Perfect size for the work I do. Purchased two so I didn't have to reset measurement to mark multiple pieces. Great tool at a great price! Love shopping grizzly first. Good quality instrument. Makes layout much easier and more accurate. Reasonable price and quick delivery. Only regret is that I didn't get one sooner! This height gauge works great for marking the center line on my knife blade blanks.verry accurate scribe lines can easily be made. I bought this a few months ago after reading a story in Fine Woodworking (Issue #218, by Mark Shofield). The tool has performed exactly as described. It has sped up my set-up for using my jointer and tablesaw. I heartily recommend getting one for yourself. I am trying my hand at knife making via the stock removal method. In this you need to mark the edge of the metal that will form your cutting edge. I have used calipers and a tool specifically made to do this but both methods did a poor job. I finally had an opportunity to use the height gauge and was thrilled with it's ability to mark well defined lines into the metal with the carbide tip. I expect that over time this will wear but I am sure that the tip is replaceable. This gauge, like many of the Grizzly items, is very well priced and you always seem to get more than you paid for. 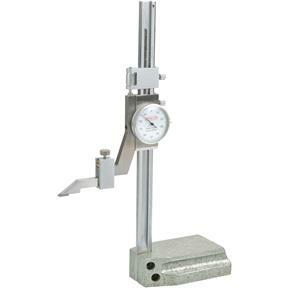 You can spend a lot of money for a height gauge but if does the job well putting a line on a piece of material where you want it spending more money doesn't make sense. If you want to mark a piece of stock at 2.000 or 0.686 and it does it you've bought a good and accurate tool. You can always buy more bells and whistles but if your trying to get away from wrestling with a machinist square and scribe this tool will do the job as well as anything made.